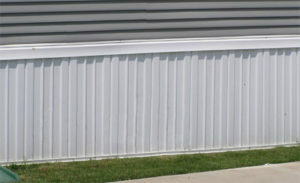 What is Mobile Home Skirting? What is underpinning? It is the trim installed on a mobile home between the ground and the mobile home sides. 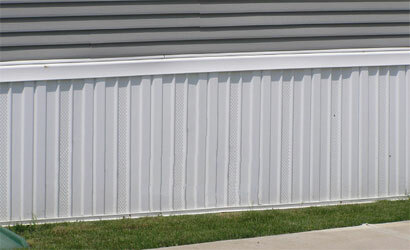 It effectively covers up the concrete blocking and any wheels and axles hanging from the home. It can be made from a variety of different materials which have their own advantages and disadvantages as will be explained in the following article lower down the page. Keep out rodents and animals. 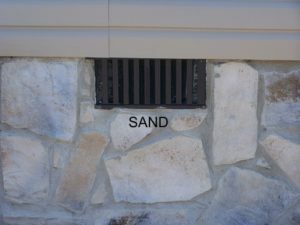 Unless the skirting has integral ventilation openings that meet the following ventilation requirements, install equally sized ventilation openings on at least two opposite sides of the foundation. Size ventilation area to equal at least one square foot for each 150 square feet of under-floor area when no vapor barrier is used. 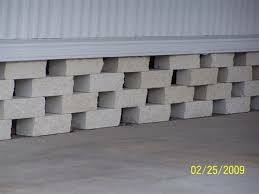 The recommended ventilation for homes with vapor barriers is one square foot for each 300 square feet of under-floor area. Place vents as high above the ground as practical. Cheapest vertical vinyl skirting around $800. Usually included in the setup permit application. 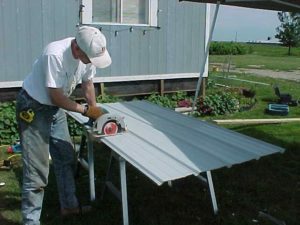 If you take the time to layout the bottom track in reasonably straight line and make sure that the corners are square, then installing vertical vinyl skirting is a DIY, do it yourself job on a mobile home that can be tackled by a homeowner with basic tools and average ability. Loose split block skirting arranged in a staggered pattern as shown above would be another mobile home job that is a do it yourself project. 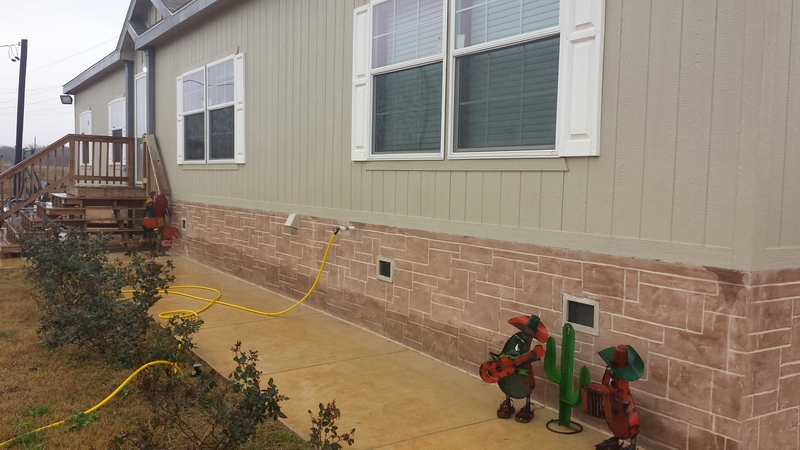 The job from start to finish will probably take a whole weekend on a mid sized double wide manufactured home. Jobs involving stucco and stone are perhaps beyond the capabilities of the majority of homeowners.